Join us April 28th in Kennebunkport, Maine for the 2019 Lighthouse Gala! This annual celebration will be held from 1-5pm in the ballroom of the beautiful Nonantum Resort (95 Ocean Ave) in historic Kennebunkport! Through A New Lens: Augustin Fresnel, a Living History portrayal of Mr. Fresnel’s fascination with “finding the solution to the many questions in the inexhaustible range of science”. His journey reveals a lifetime of personal challenges, scientific curiosity, and innovative achievements. 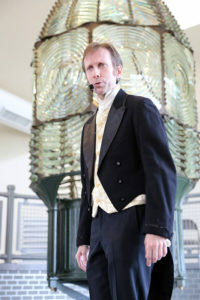 Fresnel’s courage and perseverance, along with guidance from his mentor, Francois Arago, unfolds in an engaging story that brings to life Augustin Fresnel’s personal legacy of “illuminating the seas, saving lives and creating new light in new venues yet to come.” Joseph Smith, who portrays Augustin Fresnel, is a Performing Artist of Living History whose mission is “to create excitement and curiosity about history by giving voice to stories that celebrate the human spirit”. Award Presentations, including the Keeper of the Light and ALF Len Hadley Volunteerism Awards. Dinner prepared by the Nonantum with your choice of: Prime Rib Roast au Jus, Chicken Florentine or Baked New England Haddock and includes salad, dessert, coffee & tea. Cash Bar. A fabulous selection of Silent Auction items including: lighthouse overnights, prints, gift baskets, collectibles and more!